A unique and beautiful handcrafted gift for that special someone. Valentine’s Day is just around the corner and it’s the perfect opportunity to tell your sweetheart what you have in your heart. If you can’t find the right words to express your love, why don’t you say it with flowers? Roses and Gold are symbols of love, beauty and value. 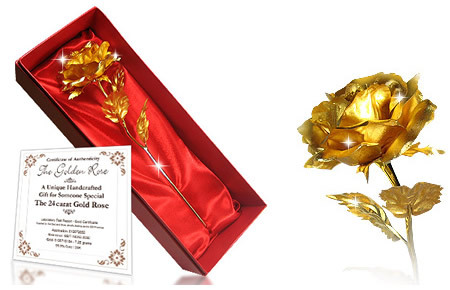 This precious Golden Rose is the perfect and most romantic way to make a lasting impression on the person you adore. The 24k Gold Rose comes in a beautiful presentation box with a certificate of authenticity. There is no finer symbol for a lifetime of love! The lovely Golden Rose is the perfect Valentine’s Day gift for your wife, girlfriend, mum or grandmum. Show them your affection with a valuable rose that lasts forever!